The Federation University Australia Art Collection aims to develop and maintain an important public art collection of high quality works of visual art which contributes to the intellectual and cultural enrichment of its student body, staff and wider community. The collection enhances the physical environment by adding colour and liveliness to the University and is displayed throughout our Ballarat, Gippsland (Churchill), Stawell and Horsham campuses. It provides a valuable educational and research experience, as well as a providing potential to mentor. The earliest works in the collection are associated with the Ballarat Technical Art School, although a coordinated approach to collecting was initiated by the Ballarat Teachers' College. Collection has continued over the decades, and has benefitted by generous gifts under the Cultural Gifts Program. The collection covers most periods of Australian Art, and while most media is found it in the collection, it is predominantly Australian painting, printmaking and sculpture. Works by renowned Australian artists feature, as well as staff and students associated with Federation University Australia or its predecessor institutions. 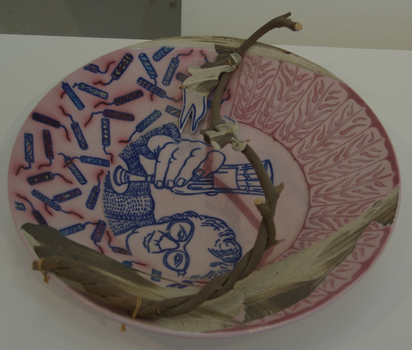 This work is part of the Jan Feder Memorial Ceramics Collection. 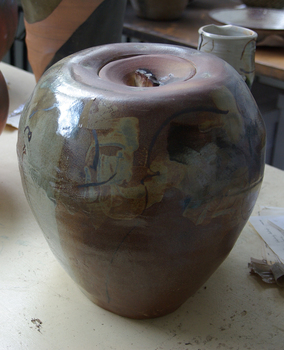 Jan Feder was an alumna of the Gippsland Campus who studied ceramics on the campus. She passed away in the mid 1980s. Her student peers raised funds to buy ceramic works in her memory. They bought works from visiting lecturers who became leading ceramic artists around the world, as well as from many of the staff who taught there. A plaster marquette of Prime Minister Malcolm Fraser produced for the bronze bust in the Ballarat Botanical Gardens' Prime Ministers Avenue. 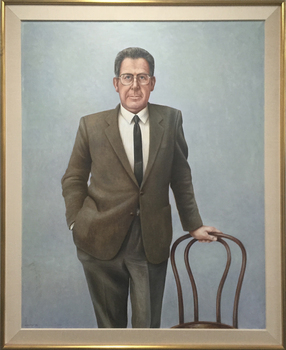 John Malcolm Fraser AC, CH, GCL (21 May 1930 – 20 March 2015) was the 22nd Prime Minister of Australia and the Leader of the Liberal Party from 1975 to 1983. Fraser's bust was originally created by Victor Greenhalgh. However, Greenhalgh and others were critical of the final casting. Following Greenhalgh's death in 1983, Peter Nicholson was asked to create a new bust for Fraser, which was completed after the bust of Fraser's successor Hawke had been installed. This item is part of the Federation University Art Collection. The Art Collection features over 1000 works and was listed as a 'Ballarat Treasure' in 2007. Framed lithograph in predominantly blue and black. Signed lower edge " Proof 2/5. 'Nocturne'. Graham King '63." 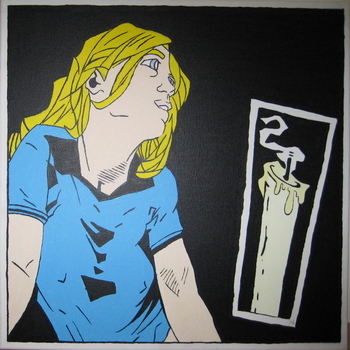 Canvas painting of a girl with blonde hard watching a candle which has just been sniffed out. Framed painting of a girl in a green jumper. Noirin Wojciechowski was underaking a Bachelor of Creative arts (Honours) and the University of Ballarat Arts Academy when this work was created. This item is part of the Federation University Art Collection. The Art Collection features over 1000 works and was listed as a 'Ballarat Treasure' in 2007. Framed Australian Surrealist work. 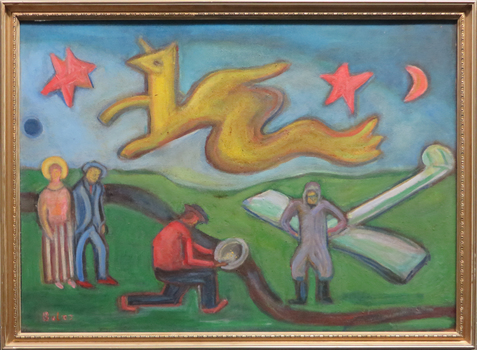 Artist's Comment: "The landscape of the Valley is in between Ballarat and Geelong, the pranged aeroplane came from Geelong, the prospector and the strolling couple are surreal props to the scene, and the poetic hippogriffen serves as a bunyip which coul dbe a local connotation of apprehension od bush loneliness. Gift of Lyndsay Boles. Bernard BOLES (1912-2001) Born Benalla, Victoria Bernard Boles studied at Melbourne Technical College and in London. He was known as critic, writer, sculptor and painter. His works were influences by Cubism and Surrealism. Boles exhibited widely in London and on his return to Australia in 1964. "Boles drew on the biomorphic marine imagery typical of Surrealism all around the world, as seen for example in the work of Wadsworth and Yves Tanguy. In 1949 Boles, having been rejected from the Victorian Artists’ Society, would tie two pictures to the fence outside the show and spend the ensuing two weeks sharing his views on art with passersby." ('Surrealism and Australia: towards a world history of Surrealism' by Rex Butler and A.D.S. 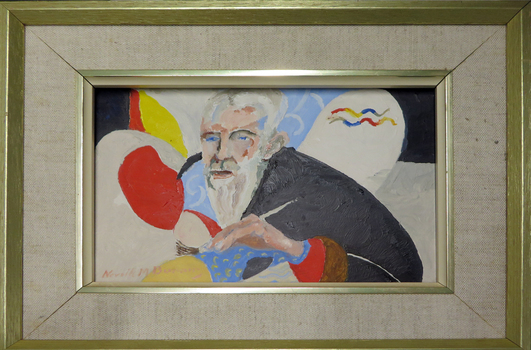 Donaldson) This item is part of the Federation University Art Collection. The Art Collection features over 1000 works and was listed as a 'Ballarat Treasure' in 2007. Celia Rosser (1930- ) Born Melbourne, Victoria Celia Elizabeth Rosser is a renowned Australian botanical artist, best known for having published The Banksias, a three-volume series of monographs containing watercolour paintings of every Banksia species. She trained in Art at the Melbourne Institute of Technology In 1970, Celia was appointed Science Faculty Artist at Monash University. Four years later she was appointed University Botanical Artist, and began the project of painting every Banksia species. The project took over 25 years to complete, and resulted in the publication of a three volume monograph entitled The Banksias, with accompanying text by Alex George. Publication of the final volume in 2000 represented the first time that such a large genus has been entirely painted. 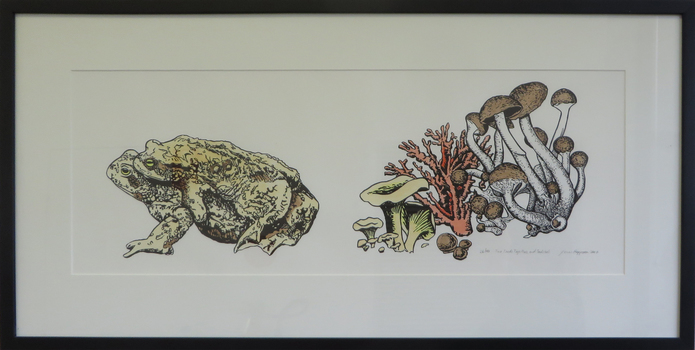 In 1977 Celia Rosser was awarded the Linnaean Society of London's Jill Smythies Award for botanical illustration, and in 1995 was awarded a Medal of the Order of Australia. Monash University awarded her an honorary Master of Science degree in 1981, and an honorary PhD in 1999. Banksia Rosserae is the last banksia species discovered and was named after the artist. Since 2002, the Friends of the Royal Botanic Gardens Melbourne have awarded the "Celia Rosser Medal for Botanical Art" to outstanding exhibitors at their "The Art of Botanical Illustration" exhibition. This item is part of the Federation University Art Collection. The Art Collection features over 1000 works and was listed as a 'Ballarat Treasure' in 2007. Australian Print Coucnil Commissioned PRint. 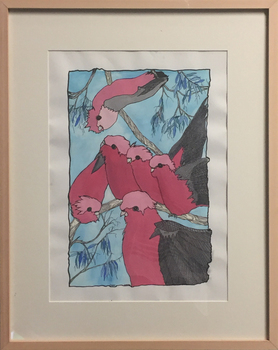 Framed watercolour of a number of galahs in a tree. If you are able to provide information on this artist or artwork please use the comment s box below. Press moulded pot. Gift of the artist. Len CASTLE (23 December 1924 – 29 September 2011 ) Born New Zealand 'My best work is when intuition and conscious choice come together successfully.' 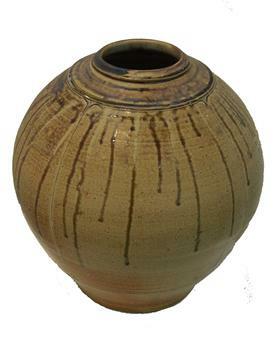 Len Castle trained as a secondary schoolteacher and started making pottery in 1947. Initially self-taught, he was the first potter to be awarded a fellowship from the Association of New Zealand Art Societies, travelling to St Ives to work with Bernard Leach in 1956-57. He lectured at the Auckland Teachers' College until the early 1960s, before concentrating on making stoneware at Titirangi, New Zealand. 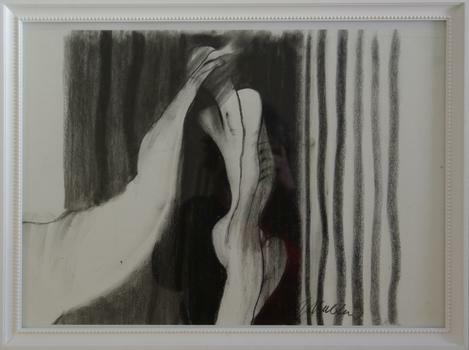 Black and white charcoal drawing in white frame with glass. Salt glazed stoneware pot This work is part of the Jan Feder Memorial Ceramics Collection. 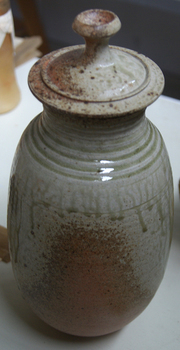 Jan Feder was an alumna of the Gippsland Campus who studied ceramics on the campus. She passed away in the mid 1980s. Her student peers raised funds to buy ceramic works in her memory. They bought works from visiting lecturers who became leading ceramic artists around the world, as well as from many of the staff who taught there. John DERMER (1949) Born Melbourne, Victoria John Dermer studied Ceramics at the Royal Melbourne Institute of Technology and Hawthorne State College (Diploma of Education), before working in potteries in England. 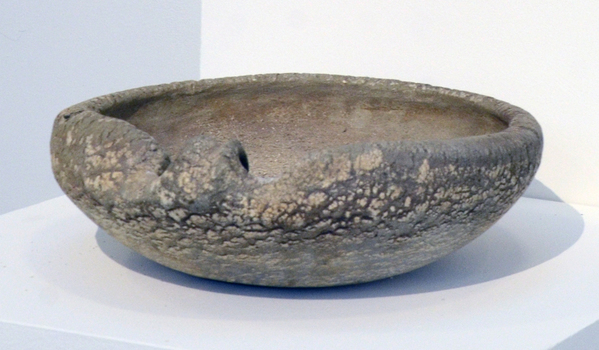 Upon his return to Australia he established "Kirby's Flat Pottery" studio at Yackandandah, Victoria in 1974. John is proudly a product of the Leach/Hamada movement in ceramics. He sees this as a tradition that for him represents the essence of working with clay. The lines are pure and balanced while the forms are honest, proud and passionate. Yars of research and experience in salt glazing were rewarded in 2006 when John Dermerwon the highly prestigious Saltzbrand Keramik International Award in Koblenz, Germany. Another avenue of ceramics for which John is renowned is in the field of terra sigillata. This passion had its foundation back in 1987 when he received a major commission from Romaldo Giurgola and Pamille Berg for the new Parliament House in Canberra. During the completion of these massive pieces for the Prime Minister’s suite and Cabinet entry he had to invent and develop methods for decorating and firing the pots successfully. The completed pieces are still regarded by John as some of his finest works. This work is part of the Jan Feder Memorial Ceramics Collection. 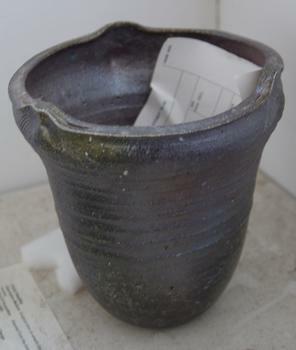 Jan Feder was an alumna of the Gippsland Campus who studied ceramics on the campus. She passed away in the mid 1980s. Her student peers raised funds to buy ceramic works in her memory. They bought works from visiting lecturers who became leading ceramic artists around the world, as well as from many of the staff who taught there. If you are able to assist with information on this artist or artwork please make contact via the comments link below. 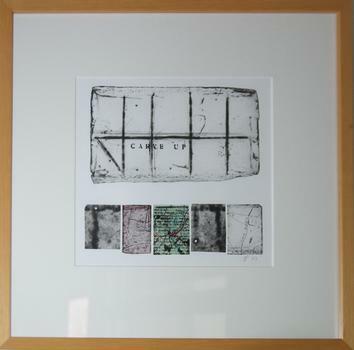 The Gippsland Art School collects examples of limited edition prints to use as a teaching collection. 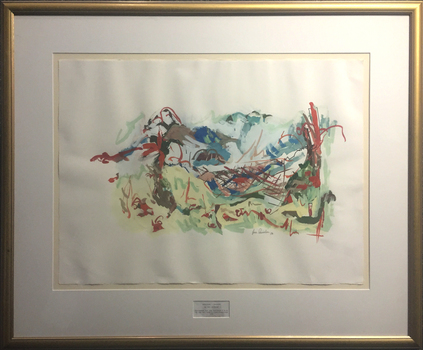 The collection is largely unframed and comprises works from the Print Council of Australia, staff members and former students. Framed abstract painting. If you can provide information on this artist or artwork please use the comment link below. This item was purchased for the Ballarat College of Advanced Education (later Federation University Australia) by the Art Acquisition Committee. It is part of the Federation University Art Collection. The Art Collection features over 1000 works and was listed as a 'Ballarat Treasure' in 2007. 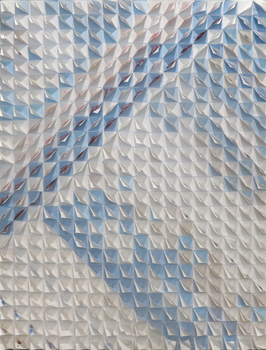 Mural consisting of 4 panels. Leonard FRENCH ( 8 October 1928 - 10 January 2017) Born Brunswick, Victoria In early 1959 Leonard French was commissioned by the Ballarat Teachers' College students to paint a mural. The students were responsible for the payment of the work. When unveiled artist George Bush remarked: "the 1959 students have left something not just to 'oooh' and 'ah' at, but something that is thought provoking, arresting and interesting. This work of art keeps something in reserve and draws you to search for deeper meaning behind the splendour of colour. This mural is not one which will not fade the interest of its beholders, but one which will provide intrigue for generations to come." This item is part of the Federation University Art Collection. 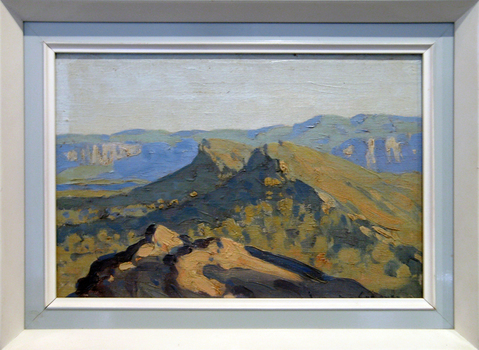 The Art Collection features over 2000 works and was listed as a 'Ballarat Treasure' in 2007. A woven New Zealand flax eel trap with emu feathers. This work won the University of Ballarat Acquisitive Award for work reflecting Victoria's Western District. The judges were impressed by Bronwyn Razem's translation of the traditional eel trap into a sculptural form evocative of the flow of water and possible the passage of time. The design and technical knowhow which Razem inherited from her mother, uncles, and grandfather connects this work to the family;s life and traditions. She then enhances the simplicity of this very functional object by the addition of delicate emu feathers, creating a work that creatively and symbolically transcends its original form. Artist's Statement: "The breeze going through the eel trap gives a feeling of water flowing through the vessel with the feathers softly waiving as the water flows. My grandfather Nicholas Couzens and my uncles made eel traps to fish the Hopkins River - this is how my mother learnt the techniques which she passed on to me." Bronwyn RAZEM Gunditjmara/Kirrae Whurrong Bronwyn Razem is an Indigenous Australian basket weaver and painter. She is a Gunditjmara woman of the Kirrae Whurrong clan of western Warrnambool on the Victorian coastline. Bronwyn’s practice involves an exploration of her Indigenous heritage and identity, and she creates symbolic representations of places and events that are meaningful to her family. She integrates ochres, sand and other materials into her paintings, and her works also draw on the possum skin cloak traditions of her ancestors. In 2008, Bronwyn was chosen by the Australia Council for the Arts to be part of a delegation of Indigenous artists to attend the 10th Pacific Arts Festival in Western Samoa. Bronwyn’s mother, Aunty Zelda Couzens, was a well-respected basket weaver and elder who taught Bronwyn basket-making techniques. Bronwyn now regularly conducts basket weaving workshops with Victorian Indigenous communities in order to facilitate the revival of cultural traditions. She has a Bachelor of Arts with Honours at Deakin University, and in 2008 she was enrolled in a Master by Research degree at Deakin Institute of Koorie Education, Geelong, and was living in Ballarat. (https://www.daao.org.au/bio/bronwyn-razem/biography/, accessed 18 April 2016) This item is part of the Federation University Art Collection. The Art Collection features over 1000 works and was listed as a 'Ballarat Treasure' in 2007. Max Hopper was Director from 1979 to 1983. Framed landscape featuring mountains. If you are able to provide information on this artist or artwork we would be happy to communicate with you via the comment link below. Debbie LLOYD Debbie Lloyd returned to study in 2005 completing a Bachelor of Fine Arts (Visual Arts) degree at the University of Ballarat (now Federation University) in 2007, with honours the following year. She returned to the university as Artist in Residence in 2009. 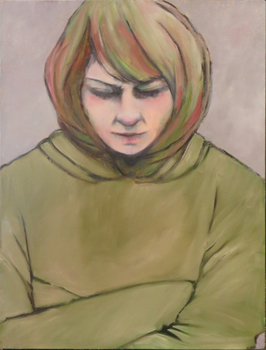 During her time at the University Debbie exhibited in many group exhibitions and her work was selected for the National Graduates Show at PICA in Western Australia. Debbie’s first solo exhibition was held at Space22 in Ballarat, towards the end of 2010. This item is part of the Federation University Art Collection. The Art Collection features over 1000 works and was listed as a 'Ballarat Treasure' in 2007.